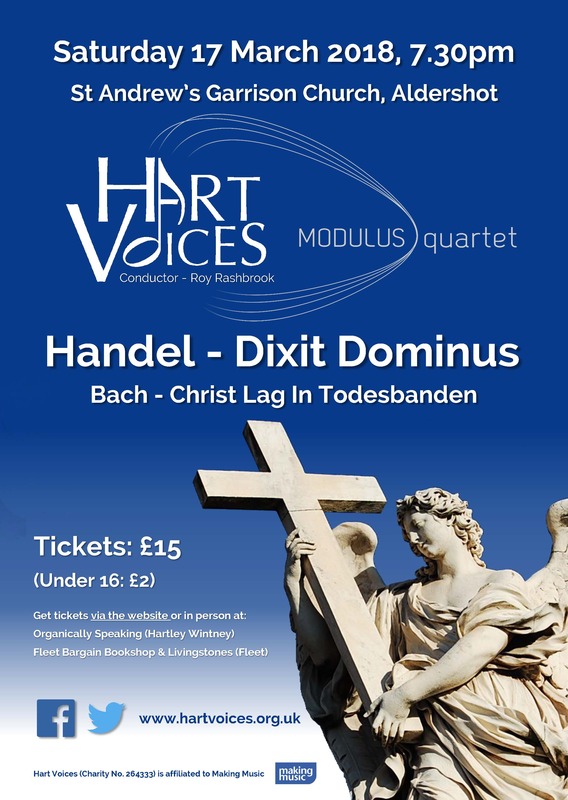 Hart Voices presents Handel’s Dixit Dominus and Bach’s Christ lag in Todesbanden. Conducted by Roy Rashbrook, Musical Director of Hart Voices (and member of St Paul's Cathedral Choir) we will be joined by the fantastic Modulus Quartet and a host of incredible soloists. We would be delighted if you would join us on Saturday 17 March 2018 at St Andrew’s Garrison Church in Aldershot to revel in the unremitting energy and dramatic intensity of Dixit Dominus, Handel's earliest surviving autograph (from 1707), often regarded as one of his finest works, and to enjoy Christ lag in Todesbanden, one of Bach's earliest cantatas for Easter (also from around 1707), often considered to be a bold, innovative piece of musical drama. Tickets cost £15 (under 16 - £2) and include interval refreshments.